For those of you who are new to the website, under the Arkansas Fossils tab is a list of fossils that have been reported in Arkansas. For those of you returning to the site, you will find a new addition to the page. Using the Arkansas Geological Survey regions map, I have marked where in the state fossils have been found. Want to know where to find conodonts? Looking for dinosaurs? Check the map to get a general location. At some point, I would like to make the map interactive, so that visitors can click on the map and be taken to information about that fossil. Unfortunately, I do not yet have the technical ability to do that for this WordPress template. Should someone find such task within their abilities and has an interest in contributing to the site, please contact me. Here is the map you can find on the fossils page. 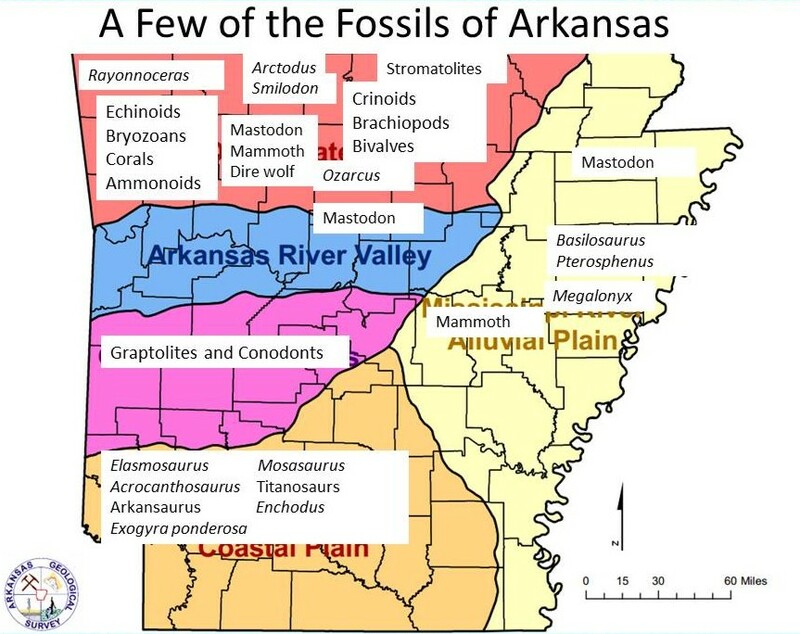 Arkansas Geologicl Survey regional map, annotated with reported fossils. By paleoaerie in Fossils of Arkansas, Paleontology on April 29, 2015 .